Communities which cope with climatic hazards by im plicitly assuming a continuance of the status quo learn harsh lessons. Despite this, quite limited adaptation to known risks is often apparent in contemporary society. In the past, the catastrophe of harvest failure led to sometimes quite sophisticated coping responses and the shunning of areas of known high risk based on the collective folk memory of the communities concerned. In the present, however, the most typical response has been to develop a climatic fingerprint, usually of three decades or so of climate observations, as the basis for forward planning. Engineers, farmers, and planners extrapolate from this for guidance on the probable range of extreme events which will be experienced during the lifetime of a structure, or over a range of harvests. These are now demonstrably flawed approaches as the nonstationarity of climate time series has become apparent. An inherent characteristic of climate is change, and a period of rapid change is now underway which has the potential to threaten the fabric of society in many parts of the world during the present century. Indeed there are major initiatives emerging at both the highest political levels, as evidenced by international treaties such as Kyoto, as well as bottom up initiatives such as the ‘transition towns’ which are indicative of growing public sensitivity to the magnitude of the problem faced. A fundamental reassessment of human–environment relations is an integral part of coping with what is viewed as the most severe problem facing the world in the present century. Instrumental observations provide the optimum means of comparing past and present climates. Invention of key instruments, such as the thermometer (Galileo) and barometer (Torricelli) generally occurred in Renaissance Italy in the late sixteenth and early seventeenth centuries, though records from these times cannot be safely relied upon. The quality of the instruments, especially the glass used, varied widely and the multiplicity of scales and exposures posed additional problems of comparability from place to place and over time. It was the Industrial Revolution, with the need to construct public water schemes to alleviate the unhygienic conditions of the coalfield cities of Western Europe, which provided the main impetus for the development of a more elaborate meteorological network. The demands of the railways for a standard time system in the early years of the nineteenth-century also required a more rigorous temporal regime within which comparable observations could be made. Gradually, the observational network was extended overseas by the European maritime colonial powers, albeit with a coastal bias which limited understanding of tropical climates for many decades. Outside of Europe and parts of North America, the length of the observational record is frequently quite short and provides only a limited insight into the climatic conditions before the middle of the twentieth century. Alternative ways of deducing past conditions have therefore been developed. A long tradition of documenting climate extremes exists in some countries such as Iceland, China, and Ireland (Figure 1). 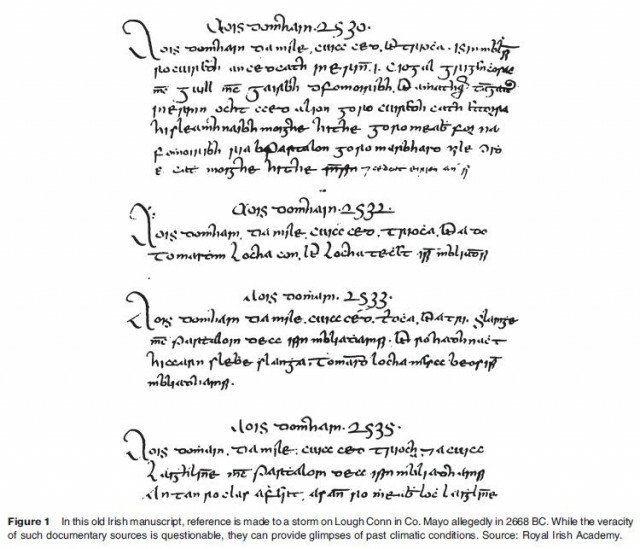 Similarly, dates on which harvests occurred, or on which flowering of particular plants took place, or when other natural events such as bird migration occurred were often meticulously documented. Collective decisions about when in autumn to pick the grapes for wine making in some of the villages in northern France are recorded back to the fourteenth century, while in Japan the date in spring when the Emperor traveled to Kyoto to view the newly flowered cherry blossoms was similarly recorded. Comparison of when such events take place today with local instrumental observations enables calibration of such documentary sources to be achieved, providing rudimentary reconstruction of growing conditions for much of the past millennium for individual locations. Early newspapers, estate records, and ships’ logs during the era of sail also provide useful documentary sources. For example, on ships of the British Navy the log was also maintained three times daily while in port, usually by the Master who, unlike the Captain, often stayed with the same ship for the duration of his career. Compilation of such records enables rudimentary weather charts to be constructed and aspects such as storm frequency to be compared with the present day. An indirect deduction of past conditions can be derived by examining relict phenomena sensitive to the climatic conditions which prevailed at the time they were laid down. Some tree species growing in climatically stressed environments produce annual growth rings symptomatic of the conditions prevailing during the season concerned. Calibration of the ring width or the cell density with proximal instrumental measurements of climate for the same period enables a transfer function to be established which can be applied to the rings formed before the observations were available. Moreover, by overlapping ring records from the present with older wood, a technique known as crossdating, the record can be pushed back several thousand years. In some cases, individual high magnitude, low frequency events, such as volcanic eruptions, can be detected. Pollen grains provide a lower resolution record than tree rings, though they enable a better picture of overall environmental changes to be discerned. Pollen production is prolific for some plants, and pollen grains resist decomposition very effectively if deposited in anerobic conditions, such as in a lake bed or peat bog. Since species tend to produce distinctively different pollen types, analysis of a particular layer enables the deduction of the compositional vegetation characteristics at the time the layer was deposited. From the vegetation assemblage, the prevailing climate may be deduced and its fluctuations charted over time by examining sequential layers of pollen. Although this generally only results in relative dating of events, a time calibration is often possible using carbon isotope dating of organic deposits such as bones, antlers, etc. also deposited in a particular layer. Closely related to the palynology methodology is climatic reconstruction based on beetle remains. 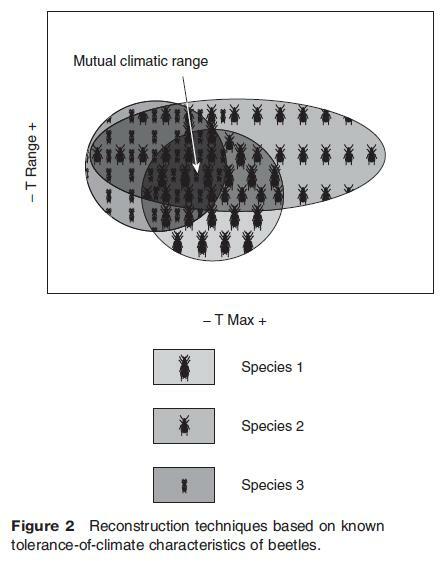 Again, the tolerance of the species to present day climate is used to infer palaeoclimatic conditions (Figure 2). Deep cores have now been drilled into the icecaps on Greenland and Antarctica. The annual layers of ice here are delimited by slight melting during the short summer periods. While air bubbles trapped in the ice enable the composition of the atmosphere during past periods to be inferred, it is the isotopic composition of the oxygen making up the ice itself which provides the palaeoclimatic information. Isotopes of an element occur because of an additional neutron or two in the atomic nucleus, rendering the nucleus slightly heavier than the normally occurring form of the element. In the case of oxygen, about 0.2039% of a typical sample will consist of 18O atoms as opposed to the normal 16O atoms which account for almost all of the remainder of the sample. During evaporation, ocean water made up of the lighter 16O atoms enter the vapor phase more readily than their heavier counterparts. If this water vapor then condenses and falls as snow during cold periods it may not recycle back to the oceans for extended time periods resulting in the ocean waters becoming selectively impoverished in 16O and enriched in 18O. Measuring the ratio between these two isotopes in layers of glacial ice thus provides a geological thermometer enabling a snapshot of global temperature conditions at the time the snow was obtained. Similar methodology can be used in analyzing the microscopic shells found by drilling into undisturbed layers of sediment on the ocean floor. These were built by creatures using the oxygen in the seawater in which they lived. This can yield data on the temperature of the ocean in which they swam as far back as 2 million years ago. be considered hyperarid. After the peak of the mid-Holocene warmth, drying introduced climatic stresses to many of these places and concentration around reliable water sources such as oases and river valleys seems to have occurred. A strong correlation between CO2 concentrations as deduced from analysis of air trapped in the ice layers and temperature as inferred from the isotope analysis is evident, implicating this greenhouse gas as a historic regulator of global temperature. However it is important to emphasize that it is not CO2 which initiates the temperature rise at the end of a glaciation, and in fact a rise in CO2 tends to lag several centuries behind the rise in temperature during this event. This is related to a delayed response from the oceanic CO2 reservoir and, once this occurs, amplification of temperature rises takes place as a result of normal greenhouse gas processes. Cooler and moister conditions prevailed over much of the eastern Mediterranean in the centuries during which imperial Rome spread its influence across Europe. Gradually, increased frequency of drought conditions further east in Asia spread westward, bringing plagues and mass movements of population in its wake, ultimately to undermine Rome itself. Cooler, stormy conditions set in over much of Europe after 400AD. Toward the end of the first millennium AD, temperatures in Northern Europe appear to have been about 1 °C warmer than the mid twentieth century. This Medieval Warm Period lasted for about three centuries, but was not a global warming event. Harvests were easier, especially in the northern lands where wheat could be grown in northern Norway, oats in Iceland, and barley and rye in Greenland. Viking voyages into the Mediterranean, up the rivers of northern Russia, to the edge of the polar ice, and into the western ocean as far as Greenland and Canada were facilitated by benign climatic conditions. However, by 1200AD a downturn was beginning. The ice was returning to the seas around the colonies in Iceland and Greenland and supply routes were becoming increasingly difficult. The Danish parliament debated whether Iceland should be evacuated after a major volcanic eruption in 1783–84 which caused further hardship. By 1540, the last inhabitants of the Greenland colony had died, their demise inevitable as a result of their failure to adapt to the changed climatic conditions as the Inuit had so successfully done. The Little Ice Age (1450–1850) was also considered previously to have been a period of global cooling, though current views tend to suggest cooling varied greatly over time and space. However, for the Northern Hemisphere as a whole, the Little Ice Age most likely contained the coldest three century period of the entire postglacial record. The Mediterranean froze twice around Marseilles. The Thames froze on at least 20 occasions and slabs of sea ice 5 km in extent appeared in the English Channel. An Eskimo was observed paddling his kayak in the mouth of the River Don near Aberdeen in the early 1700s. Harvests failed and famines occurred in many parts of Europe. In North America, glaciers doubled in extent in the Rockies and moved downslope by 400 m. Recovery from the Little Ice Age has now taken place with a vengeance and furthermore, in contrast to the changes of the last two millennia, the changes of the twentieth century have an undisputed global warming signature. The Sun delivers 1370Wm 2 on a level horizontal surface at the top of the atmosphere. Any variability in this could be expected to cause climate change and it seems probable that on geological timescales, this has been the case. On shorter timescales, small changes in solar irradiance have been detected by satellites over the past three decades. These, however, are too small to explain the temperature variations which have occurred over the same period. The best known causes of solar output changes are caused by disturbances on the surface of the Sun which manifest themselves as sunspots. These exhibit a cyclical behavior, typically of 11 years but embedded in longer cycles of 22, 80–90, and around 180 years. Attempts to link sunspots to climate trends have proven inconclusive, though the coldest decades of the Little Ice Age corresponded to a period when sunspot activity declined to almost zero. Fluctuations in the receipt of solar energy also happen due to three cyclic variations in the Earth’s orbit around the Sun. Eccentricity changes occur over a period of 96 000 years whereby the orbit changes from its most elliptical to a near circular mode. This results in upto 25% more radiation arriving at the Earth as a whole when it is at its point of closest approach to the Sun as opposed to 6 months later when it is most distant. The tilt of the Earth’s axis also changes over a period of 41 000 years from a minimum of 21.8 1 to 24.4 1 and back. Seasonal climate contrasts are sharpened by a greater tilt. Finally, the elliptical orbit itself slowly rotates changing the time of year when closest or furthest approach to the Sun occurs. This is known as the ‘precession of the equinoxes’ and occurs on a 22–23 000 year cycle. None of these changes affect the annual total of radiation receipt, though when combined they appear to have the potential to reduce seasonal receipt at high latitudes and have been implicated in causing the glacial/interglacial oscillations of the past 2 million years. A Swedish chemist, Svante Arrhenius, suggested in 1896 that if atmospheric concentrations of the trace gas CO2 were to double, global temperatures could increase by about 5°C. Though at that time thought of as a somewhat hypothetical possibility, the contention is proving increasingly prescient. Preindustrial concentrations of about 280 ppm have now risen close to 380 ppm princi pally as a result of anthropogenic emissions. Annual fossil fuel related emissions are currently of the order of 7.2 Gt carbon with a further annual contribution from land use changes such as deforestation of 0.5–2.7 Gt carbon. Increases in other greenhouse gases are also occurring. Methane has already doubled from its preindustrial concentration. About 60% of emissions are related to anthropogenic activities. Nitrous oxide has increased by 13%, most likely related to increased fertilizer use in intensive agriculture. An important consideration for control policies is the residence time of greenhouse gases. While for some, such as CO2, this is very dependent on which stores atmospheric carbon eventually ends up in, other greenhouse gases such as methane have relatively short residence times. Accordingly, targeting policies on such gases offers better short term reductions in overall greenhouse gas loadings. Unequivocal evidence from a variety of sources confirms that a major global warming event is underway. Over the last 100 years, global average temperature has increased by 0.74 °C with an acceleration in warming evident over recent decades. The 11 warmest years in the instrumental record have occurred since 1995 (Figure 3). Associated with this warming have been changes in other parameters such as ocean temperatures and precipitation. Increases in precipitation have tended to be most pronounced in the mid latitudes, with decreases more common in parts of the tropics where more intense and longer droughts have also been observed. Many extremes consistent with a warming trend are increasing, such as heat wave frequency, heavy rainfall events, and the in tensity (though not frequency) of tropical cyclones. The recently published Fourth Assessment Report of the Intergovernmental Panel on Climate Change (IPCC), reflecting a consensus of 2500 climate scientists and endorsed by 130 governments, was the latest in a series of highly influential statements which reflects growing confidence that people are playing an increasingly dominant role in changing global climate. 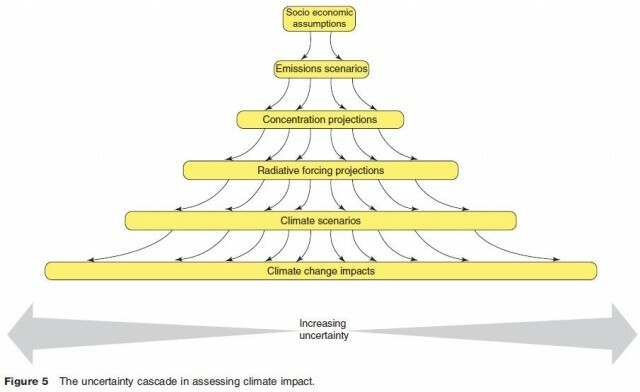 The First Assessment Report (1990) was tentative: ‘‘ythe observed increase could be largely due to this natural variability; alternatively this variability and other factors could have offset a still larger human induced greenhouse warming.’’ The Second Assessment Report (1995) was less cautious: ‘‘The balance of evidence suggests a discernible human impact on global climate.’’ The Third Assessment Report (2001) boldly stated that: ‘‘There is new and stronger evidence that most of the warming observed over the last 50 years is attributable to human activities.’’ This conclusion is now strongly reinforced in the Fourth Assessment Report (2007): ‘‘It is very likely that anthropogenic greenhouse gas increases caused most of the observed increase in globally averaged temperatures since the mid 20th century.’’ In the carefully crafted language of the IPCC, ‘very likely’ equates to ‘90% sure’. Global climate models (GCMs) have developed rapidly over recent decades in response to major advances in computing power and better understanding of how the climate system works. GCMs work by solving primary equations describing energy, momentum, mass, and water vapor at thousands of grid points on, below, and above the surface. Each equation is solved at a fixed time interval (10–30 min) enabling a progression into the future to be derived from an initial starting set of conditions. Such is the enormous computational resources required that GCMs are only maintained at a small number of facilities around the world. Early generations also simplified many of the inputs. Coupling ocean and atmosphere models was a particularly difficult task because of the latter’s much longer response time. Sulphate and nonsulphate aerosols, vegetation and atmospheric chemistry, and better representation of the carbon cycle have all recently been incorporated in most models and a range of input emission scenarios is now employed based on assumptions concerning the socioeconomic evolution of the global community over the next century. Nevertheless, GCMs have not completely overcome the difficulties associated with processes that occur on scales finer than their grid resolution, such as cloud processes. They also exhibit continuing difficulties in handling feedback processes, such as ice albedo, cloud, and water vapor feedbacks. Notwithstanding these difficulties, best estimates for global temperature increases for the end of the present century relative to the end of the last, range from 1.8–4.0 °C, depending on the emission scenarios used. The limitations imposed by computer processing capacity means that GCM grid sizes of the order of 300 km are inappropriate for environmental managers and policymakers. Downscaling of GCM output to a finer mesh resolution has thus become a major research objective, and achievement, of climate scientists over the past decade. Regional climate models (RCMs) are produced by nesting a secondary model within one or more of the grid spaces of the GCM. Outputs from the parent GCM, such as pressure, wind, temperature, and water vapor, at various altitudes for the area bounding a specified domain of interest, are used to drive the RCM. Within this domain, more spatially detailed output may be produced. Typically RCMs offer resolution of approximately 20–50 km, though even this may be too coarse for many users. In addition, the RCM suffers from any inherent deficiencies in the parent GCM since only a one way influence (GCM-RCM) is allowed. Multiple GCMs and ensemble based approaches are often used to address such uncertainties. An alternative to regional climate modeling involves a range of statistical techniques designed to downscale from coarse GCM scales. Among these are regression-based techniques, various scaling methods and the use of statistical weather generators. The most widespread is statistical downscaling (SD) which depends on strongly linking both the surface variables of interest and GCM output to a large scale atmospheric dataset from which transfer functions may be derived. Usually, upper air data is used to provide this link. Such a technique can provide downscaled output from multiple combinations of GCMs at a spatial resolution useful for guiding decisions which may be affected by future climate change. SD may require large amounts of good quality data for calibration and its effectiveness is ultimately dependent on the re liability of the parent GCMs employed. The impacts of climate change will depend not only on the magnitude of change experienced (Figure 4) but also on the socioeconomic development trajectories which the world may take over the coming decades. Adaptation measures which might mitigate impacts to some degree also require consideration. 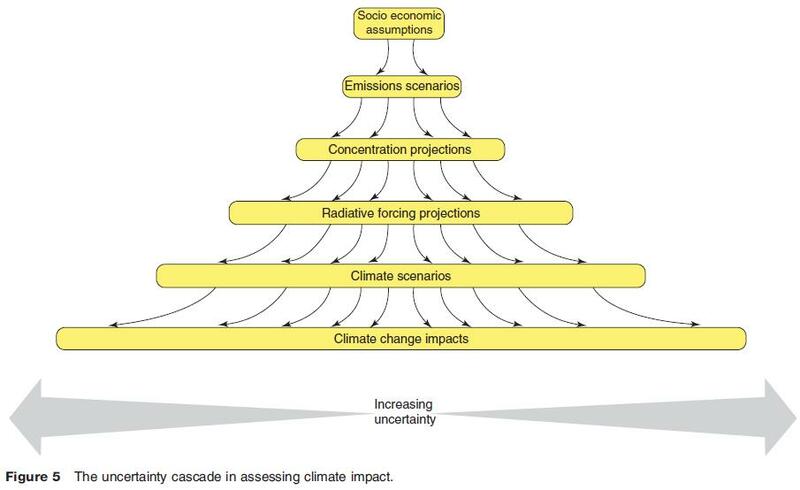 A cascade of uncertainty commencing with the socioeconomic assumptions and ending with impact assessment is evident (Figure 5). However, some confident projections are now emerging. Higher temperatures and reduced rainfall are likely to result in an increase in the extent of water stressed regions in the years ahead. Mid latitude areas such as the Mediterranean and dry tropical regions such as the Sahel are particularly vulnerable. Notwithstanding this, the incidence of heavy precipitation events is likely to increase significantly, altering flood frequency and severity in almost all parts of the world. The reductions in glacierfed river flows in the summer melting season are also likely to result in major reductions in water availability in parts of the world highly dependent on such resources. 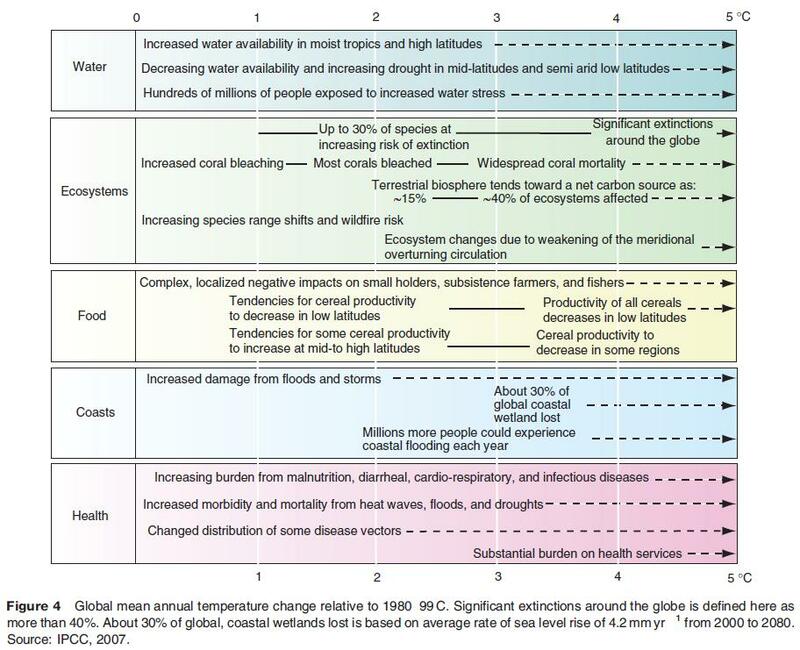 Impacts on biodiversity are expected to be considerable with 20–30% of species facing extinction if temperature rises exceed about 2 °C. Additional indirect stresses from fire, pests, and diseases are also likely to be experienced. Food potential may increase for a time at higher latitudes as additional CO2 concentrations stimulate higher yields. In northern Europe, for example, reduced winter cold is likely to assist agriculture and hydroelectric power production. But for any increase above about 1–3 °C, and indeed for any increase at all on present levels for low latitudes, crop yield potential is likely to fall. Parts of Africa are particularly vulnerable to reductions in the area of land suitable for agriculture as well as reductions in the growing season. Sea level rise estimates range from 18–38 cm for low emission scenarios to 26–59 cm for high scenarios. For densely populated deltas, particularly in Asia, and lowlying islands this poses a major threat and hundreds of millions of people will become vulnerable to flooding, a situation exacerbated where risks are enhanced by tropical storms or coastal subsidence. Some small islands will find their water resources and tourism compromised, for example, by erosion of beaches and coral bleaching. As with all climate hazards, poor communities will bear the brunt of these impacts. While in some high middle and high latitude locations, warmer winters will reduce annual heat related mortality considerably, increased incidence of heat waves, such as occurred in Europe in 2003, will be associated with increased mortality overall, and especially for the elderly. Changes in disease incidence, such as malaria and water related diseases, can also be expected. Vulnerability to climate change is greatest in developing countries with weaker economies and social institutions. People already living on the margins lack the resources necessary to cope adequately with the stresses of climate change. For some, such as the mega deltas of Asia or the low lying islands of the Indian and Pacific Oceans, the effects will be considerable; and yet the problem is not essentially of their making. This mismatch between the primary culprits and the primary victims has bedeviled international attempts to address the problem. The United Nations Framework Convention on Climate Change (UNFCCC) was agreed upon at the Earth Summit in Rio de Janeiro in 1992. This had as its ultimate objective, the stabilization of greenhouse gases at a level which would prevent dangerous interference with the climate system. The convention recognized the difficulties faced by the developing countries and assigned the lead in combating climate change to the developed countries. More detailed legally binding commitments for industrialized countries emerged in new proposals in Kyoto, Japan in 1997. Under these proposals, the developed countries were required to provide financial resources to the developing countries and to facilitate the transfer of cleaner, less polluting technologies to them. Innovative flexible mechanisms, including trading of CO2 emission rights, would be employed by the developed countries to reduce their overall greenhouse gas emissions by 5.2% by the period 2008–12 as compared with 1990. Individual targets for each country were set to take account of their particular circumstances. However, despite the Kyoto Protocol coming finally into force in 2005, progress has been slow. The USA withdrew its commitment to ratify the protocol in March 1991 and other nations such as Australia have also since refused to ratify. This, together with the fact that major developing countries such as China and India remain immune from any emission reduction requirements has limited the likely effectiveness of a treaty which was always going to be a small first step in tackling the problem. The 27 countries of the European Union (EU) have always been the main champions of emission reduction targets and have interpreted the ‘dangerous climate change’ clause of the UNFCCC to mean a global temperature increase of 2 °C. In 2007, the EU agreed a further unilateral set of cuts in their own emissions. These amount to 20% reductions on the 1990 levels by 2020. Thirty percent is on offer if the other developed countries currently not participating in the Kyoto Treaty commit to specific emission reductions as part of a new post Kyoto arrangement. However the effectiveness of any international agreement which does not involve some reductions from the most rapidly growing developing world economies is questionable. China, for example, is expected to surpass the USA as the highest emitter of greenhouse gases by as early as 2009.